Welcome to Fr Peter Walters - for the "Let the Children Live!" appeal: The “Let the Children Live” Charity was set up by Fr Peter himself. In 1982, as a student he visited Colombia. He witnessed what these children have to do to survive everyday & was even helped by a group of boys who took him under their wing & looked after him when unexpectantly he had a wait 2 weeks to get a flight back to the UK (his air ticket was a cheap open-ended one & money was running out). When he returned to the UK, he couldn’t forget the children he has meet and experienced such compassion. He learnt Spanish & embarked on an ordination course in the Anglican Church, but in his holidays he would return to Colombia taking money given to him by friends to whom he had told the street-children’s story. He worked with the Salesians of Don Bosco City & channelled the money through their projects. In 1987 he was ordained in the UK & began parish work. He was invited to go to Walsingham as Assistant Director of the Anglican Shrine. There he met many pilgrims who asked him to visit their parishes to talk about the street-children & collect money to help them, which he did on his day off each week. In 1992 the money raised by his efforts had grown, & although he approached the major UK charities, he couldn’t find any that would use the money for work with the street-children so he set up his own. The Trust Deed was signed on the Altar of the Holy House in Walsingham on 9th July. In Jan 94, Fr Peter was received into the Catholic Church & was ordained the following year. Let The Children Live! is a charity that works in Colombia with children from the streets & shanty-towns of the city of Medellín. These children were once called ‘the disposable ones’ & although that name is no longer used they are still at high social risk from the violence that they experience in the streets & shanty-towns of cities such as Medellín. Most of the danger in the shanty-towns comes from the many gangs (or bandas) that control them. Let The Children Live! is at present working with 450 very vulnerable boys & girls in this city. For most of them it is their last hope. Their ages range from babies to teenagers & they are often unloved & unwanted; even beaten, robbed, raped & sometimes murdered. By the rest of the world they are either unknown or forgotten. The charity aims to safeguard the lives of these children from the poverty & violence of the streets & shanty-towns, & to make their lives worth living by giving them love, education & a future. 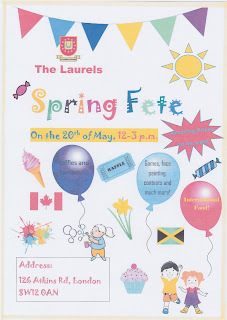 For more information on the charity: click to view their Leaflet Publication or visit their website www.letthechildrenlive.org. May - The Month of Our Lady: This beautiful month with blossoms, flowers and magnificence of colour is dedicated to our Blessed Lady. St Bernadette of Lourdes said “nothing down here can compare to the beauty which I have seen”. The natural beauty of spring and summer is a reflection of the beauty of the Creator. Also in the book of Acts our Blessed Lady is seen in the midst of the Apostles and early Christians praying for the gift of the Holy Spirit. In the same way we follow the example of Mary, Mother of the Lord in praying for the graces that each of us need. Fr Christopher: is away in Ischia at the moment with Fr Martin Edwards back on Wednesday. African & Caribbean Meeting: today after the 9.30 Mass. 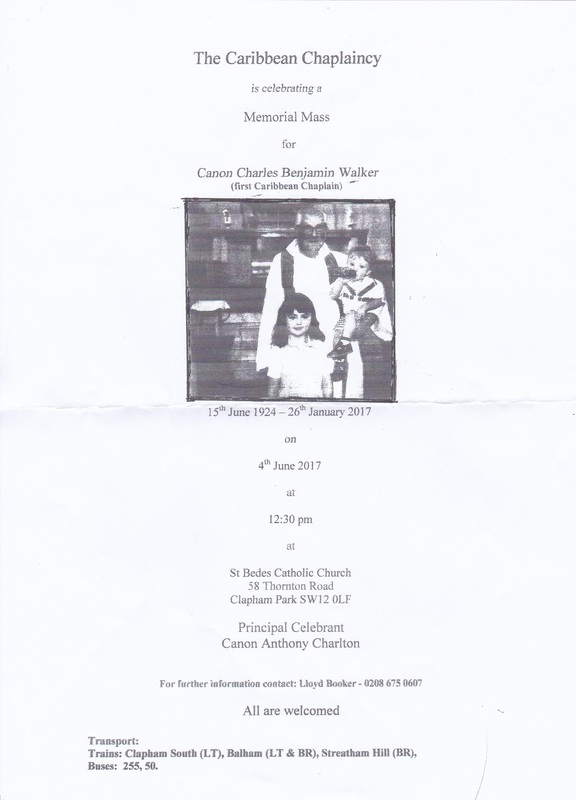 Memorial Mass for Canon Charles Walker (1924-2017): On Sunday 4th June at 12.30pm the Caribbean Chaplaincy will celebrate a Mass for Canon Charles who died in January. He was the first Caribbean Chaplain. The celebrant for this Mass will be Canon Anthony Charlton. All are welcome. Couple looking for accommodation: in local area. Please see one of the priests if you have any ideas. Congratulations to St Bernadette School: on their recent RE Inspection by the Diocese. They received a rating of “Outstanding” across all areas. Well done to everyone involved. Cleaners for this week: Tania Pereira & Sue Cranmer-Fitzpatrick.